Building a new home and want your landscape to compliment it perfectly? We can help! Let VerdeGo assist you with one of the most aesthetically integral parts of the process, the landscape! Because the landscape is one of the last steps in building a home, it can often go over-looked, or un-done. Now more than ever, a house’s curb appeal is a top priority in building a home. Studies have shown that a home having good curb appeal can increase the value of the home anywhere from 10 to 19%! Landscaping is the overall first impression of a home and can attract or deter potential future home buyers. What better time to get it done right than starting with a blank pallet. Whether you are wanting a lush tropical paradise or a low maintenance Florida friendly xeriscaping, our FNGLA certified landscape designers can assist you with finding the perfect landscape to meet your needs. Our designers have years of experience and our design center is equipped with state-of-the-art landscape design software. The result is a spectacular, full color, information-rich landscape design that will show you exactly what your yard will look like. Along with the design comes a complete itemized list of every single detail of your plan. Tired of seeing old overgrown plants? Wish that un-used space was a outdoor entertaining area? We can help! Come down to our Palm Coast Garden Center and speak with one of our certified FNGLA landscape designers. 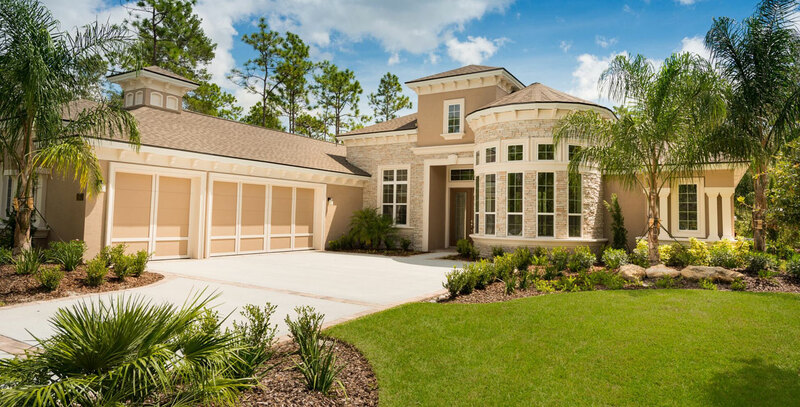 Our landscape designers will do a site visit to assess the project and then return to our Palm Coast Nursery to design a beautiful full-scaled, colored design. Our landscape designs also come with itemized lists of proposed materials so you can see exactly where your money is going. Our Palm Coast landscape re-design services can help you incorporate such beautiful aspects as: paver patios, driveways, walkways, fire pits, pergolas, water features, fountains, retaining walls, and much more! We understand that water conservation is very important. That’s why we also specialize in Florida Friendly Xeriscaping. Xeriscaping involves designing with specific plantings and irrigation options to help save you water and money. Call or stop by our Palm Coast Garden Center to set up an appointment with our designers today. Since 2002, VerdeGo Landscape has proven itself to be a leader in both residential and commercial design and landscape. VerdeGo has a professional staff of designers, irrigation experts, hardscape craftsmen, lighting designers and installation crews, available for all your commercial landscaping needs. In addition, our knowledgeable team will not only expertly design and install your landscape, but provide all the maintenance required to keep it beautiful and healthy. VerdeGo can meet the needs of all commercial properties, homeowners associations, retail properties and municipalities. We are a FNGLA member company. Contact us for further inquiries.